Introductory Price List. Prices are subject to change. Other charges may apply. Additional services available. 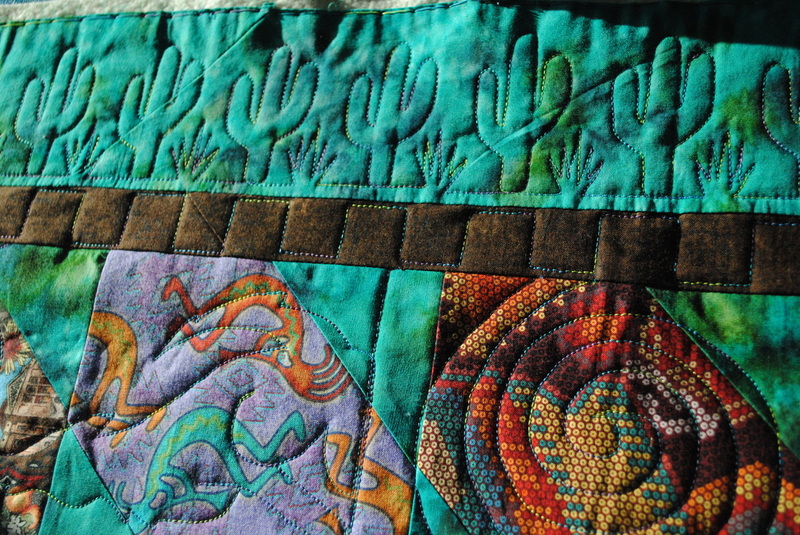 The design runs from one side of your quilt to the other, ignoring blocks and borders. The price varies slightly depending on the density of the design you choose. These designs can be pantograph designs, meanders, loops, or ??. Photo sample: Fire Escape quilt top pieced by Denny P.
The design runs from one side of your quilt to the other, ignoring blocks and borders. The price varies slightly depending on the density of the design. These designs can be hearts and loops, swirls, spirals, geometric or other designs with medium density. 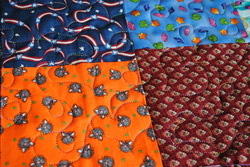 Photo sample: Scrappy squares quilt top pieced by Jill. Photo sample: Arizona quilt top pieced by Leah S.
Stitching straight lines along seam lines or across significant portions of the quilt require using a ruler. With the ruler, stitching slows and very careful attention is necessary. 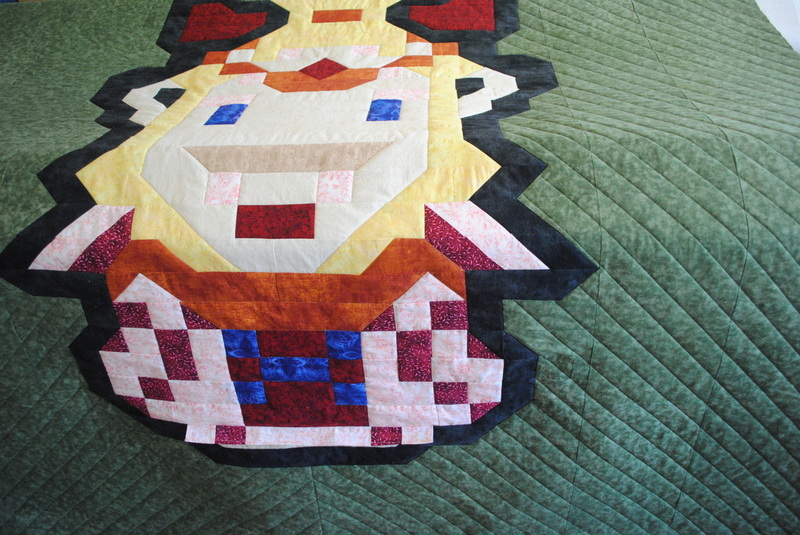 Photo sample: Princess Zelda quilt pieced by Nanci B.
Stitched in ditch in most of Zelda's head and body. Diagonal lines in background. $.006 per square inch and up with $35 minimum. Basting in an approximately six inch square grid to prepare for hand or conventional sewing machine quilting. Please provide at least one yard of fabric for the binding. Any that we don't use will be returned with the quilt. Warm & Natural 100% cotton: $11 per yard (90" wide): Warm & Natural is an unbleached, dense, flat 100% cotton batting with little loft. It shrinks about 5% when washed for that soft, antique, slightly puckered look. If you want a different batting, such as Hobbs 80/20 (80% cotton, 20% polyester) or something else, we can get that for you. You may provide the batting, too. Just make sure it's good quality to honor all the work that you put into this quilt. Make sure it's at least 8 inches longer and wider than the quilt top. Any shipping and insurance charges will be added to your final invoice. As of September 7, 2014, priority mail shipping within the U.S. with $500.00 insurance is $29.00. Standard post with insurance is $23.00. We accept payment in cash, by check, or by credit card via PayPal. 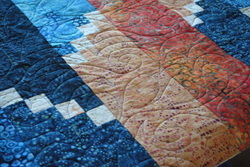 Payment is due when you pick up your quilt or before we ship the finished quilt to you.